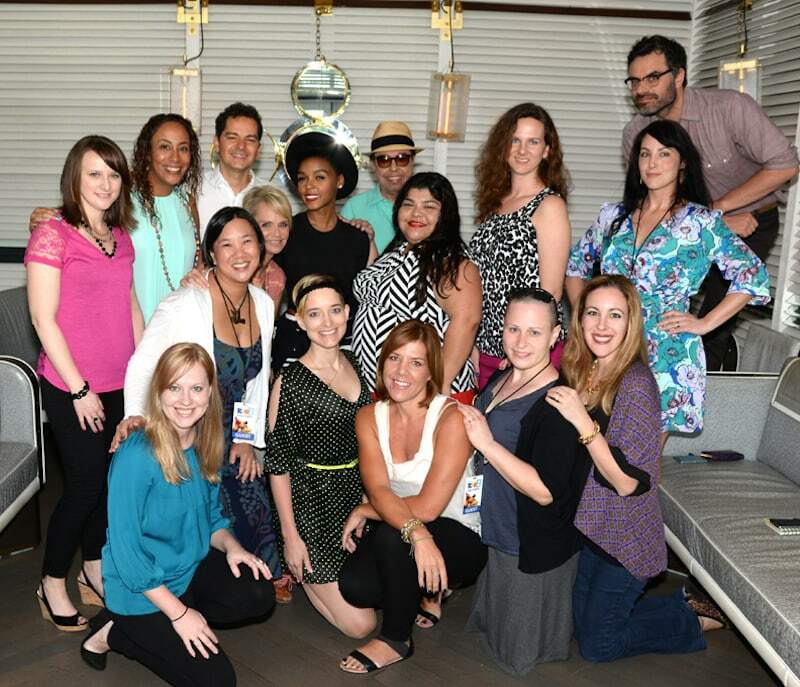 I am so happy to share the details of the group interview I did with the Rio 2 cast. We did 2 separate chats. First up we had Kristin Chenoweth, Jemaine Clement, Janelle Monae, Sergio Mendes, and Carlos Saldanha. What a way to start my morning, right?! So, here’s part 1 of our Rio 2 cast interview. Hope you enjoy it! There’s a major theme in the movie about getting the birds back to nature – to their roots – and away from technology. Is there a message in your movie to parents about stepping away from the iPod? Mr. Carlos Saldanha: Yes. I have four children, my oldest is 16 and then I have a 13 year old, a six year old and a four year old. And it’s amazing. Look, sometimes I have to say I’m guilty of just giving the iPad on the plane or iPad in a restaurant. It’s a very relatable thing. But, there are some times that we just say turn off the TV, get off of the iPod. Come on. You have a beautiful beach outside. You have a beautiful place. You have outdoors. You have your backyard. Just go out there and play. Be kids, you know? You don’t need it all the time. I think it’s a message that I think is not only personal, but is also something that a lot of the parents will relate to it. Have any of you been on an epic family adventure when you were young, or a family vacation that is memorable for you? Mr. Jemaine Clement: Oh, there were mostly torturous times in cars. Those are the bits I remember. I’m sure we had a good time when we got out of the car, but right now I remember being stuck in between my brothers in the car, so yes. Are there lessons that can be learned from your character? I mean, here we see Nigel seeking revenge on Blu from what happened in the first movie. Mr. Jemaine Clement: Yes. Yes, get revenge, kids. Get revenge. Are there positive messages that a kid can learn about? Mr. Jemaine Clement: He obviously never gets revenge. I think the message in the movie then, and in most kids’ movies, is the good guys win. And I’m not sure how accurate that is. Ms. Kristin Chenoweth: You get Gabi in the end, right? Mr. Jemaine Clement: Yes, that’s a prize. Mr. Carlos Saldanha: That’s a positive reward. You’re going to change him. You’re going to change him. Ms. Kristin Chenoweth: Like most women think we can do with men, yes. (Directed to Kristin) You’re used to theater and you’re used to using your whole body in the action and everything, and now you didn’t have that. Did you feel like you had to give more being behind animation? Ms. Kristin Chenoweth: I think what’s interesting is in this process, in this world, we put so much of our trust in this gentlemen. Because I can’t be with Jemaine, Carlos will play his voice. He’ll be Anne. He’ll be Jesse. He’ll be all of us, and somehow manages to keep you on focus, on task of your objective, which my objective is completely to be with Nigel at whatever cost, poison or murder. And I’m a very animated person. I know it’s shocking to you now. But, I still use my entire body. I think they do video us a little bit just to have as reference, and I’m still animated. And hopefully sometimes they do draw it, and you can see little glimpses of yourself. Obviously, I had several people say, “You look just like her,” and I don’t know how to take it. But, it does make me happy. It does make me happy. Mr. Jemaine Clement: It’s hard to stop using your body when you do it. Mr. Jemaine Clement: And I’m glad they have the cameras just because I would feel stupid doing the movements if there wasn’t a camera on there. Mr. Carlos Saldanha: But, it’s interesting. The first movie, when we did Rio 1, for the cast that came back it was for first sessions, that was a little awkward because you just have to learn that I’m the guy that’s going to be representing every other character but you, and we have to do it together and you have to excel. You always excel, but you have to do it beyond. I don’t rely on your face, your good looks, or who you are that people recognize to sell the character. I rely on your voice and your performance. So, I think you have to go beyond. You have to just not exaggerate it, but you have to push it as far as you can. And sometimes it’s just like, “Can you yell a little bit louder?” And their voice is already gone by the end of the day. But, “Can you just go a little bit bigger,” because we need that energy. We need just to extrapolate and do it better. And she was a trooper. She went all the way. And the last one, that’s what made it funny. In the last one, she’s just, “I can go longer. Hold on.” And she was like, “Ah.” And actually, I didn’t tell you that, but I had to shorten a little bit because you’d just keep going, going, and going, you know? (Directed to Janelle) How was working on a kid centric project different from the other stuff you’ve done, since this is your first kid’s project? Ms. Janelle Monae: Right. Well, no, I’m a kid at heart. If you listen to my music, my storytelling, I never want to get rid of my childlike essence, because it keeps me creative. It allows me to have fun and laughter and release those endorphins that just help you stay young for the rest of your life, right? And I have a niece and a nephew as well, and when I know they love my music, I go to them before I complete an album. If they’re in the car jamming, it’s right. If they’re not, I need to go back in. So, it was just incredible to have Carlos reach out to me. We actually had a lunch meeting in Rio. Mr. Carlos Saldanha: Yes, perfect site. Ms. Janelle Monae: I’m just thankful that he believed enough in me and saw that in my music. He listened to my previous work and saw the connection. He saw it. He’s really the visionary behind it, and he trusted me enough with children. And I think it transcends, though. At the samba party and even in the theaters, three year olds with their grandparents, it’s transcendent. It crosses generations, this particular animation. And so, I’m just thankful to be a part of it. Amazing!! Be sure to check out Rio 2 when it hits theatres on April 11th.